Right now, nearly all new books get relegated to the TBR shelves, and when I finish one, it moves off of these shelves and onto one of four other bookcases. How do I decide what to read? To be honest, I’ve been using a random number generator. It’s come to that point. Of course, sometimes a sequel comes out that I simply MUST READ RIGHT NOW. Or there’s a book by a favorite author that gets bumped to the top of the list. But most of the new books make their way first to this purgatorial shelf for months (sometimes years) before they are read. I probably order a new book or two every week. I buy them faster than I can read them. Why not wait till I get caught up? I’m not sure I’ll ever get caught up. I’m smart about my purchases (usually). I use coupon codes a lot, and my credit card rewards program is centered around Barnes & Noble gift cards (got one in the mail just today actually … I will probably spend it today too). I get books for gifts from people. I enter contests to win books (I was so excited to recently win Grasshopper Jungle by Andrew Smith). I’ve tried to use the library. I do love the library. But I love owning books even more. Last year I spent about $1000 on books (well, through B&N; I also bought a much lesser amount on Amazon), and I feel like that is reasonable for someone who is building a career as a writer. I feel like, so long as I am also giving money to my church, supporting my compassion kids, giving money to missions and ministries, then I can justify buying lots of books. Thoughts? Do you buy books or rely on your library? How do you choose what your next read will be? This entry was posted in reading, real life and tagged jackie lea sommers tbr list, tbr list by Jackie Lea Sommers. Bookmark the permalink. I’m quite guilty of doing the exact same thing whenever I go into a bookstore. The one thing that’s saved me from having more than four bookshelves right now are e-books, but I prefer having the physical copy. I’m always flipping back and forward as I read, which I can’t do as easily on an e-reader. I also like having the physical copies so I can lend out my favorites to other people.And the books on my shelf don’t include all the recommendations I haven’t bought/read yet! The only time I regret owning quite so many books is when I move. 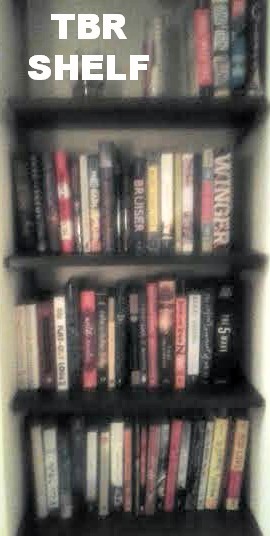 I own a small library (680 books) and it continues to grow. I rarely pay full price for a book though, I win a lot of books, buy them second hand or buy them on line when they are on sale. I like to own my books too, so I never borrow them. My TBR list on goodreads in huge – 690. I read whatever is begging me to when I look at it on my shelf. That’s an impressive library, Rochelle!! !